This booklet is designed to guide you through the foundations of Christian faith. If you have accepted Christ as your Savior and are wondering, “what do I do now?”, or if you are curious about what being a Christian means, Your Greatest Turning Point is for you. Discover how to obtain eternal salvation, why going to church and prayer is important, the purpose of baptism, how to get rid of old attitudes, a dictionary of biblical terms explained, and much more. This booklet is filled with Scripture references to guide you through seven foundations of the faith. Soft-cover, 31 pages. 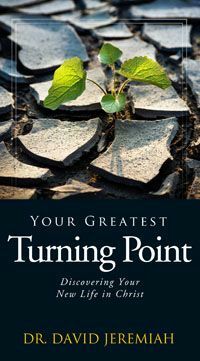 Your Greatest Turning Point is available upon request when you contact Turning Point. Where should we send your booklet?